Georgian Hotel, Dublin discount hotels and accommodation. 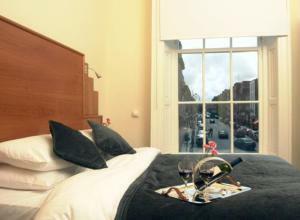 The Georgian Hotel has an excellent location, situated just a stone's throw from St. Stephens Green, Trinity College, the National Museum, the National Art Gallery and the Grafton Street shopping area, this famous Dublin Georgian Hotel features traditional style bedrooms, including family rooms. Superb Traditional Irish Bar 'Maguires' with heated smoking terrace & Restaurant all set in the grace and splendour of a delightful 200 year old house with modern extension. Ideally suited equally to the business or holiday traveller, the Georgian House offers all amenities of an exclusive hotel at great value prices. Complimentary overnight parking for guests. View photos, room descriptions and make online reservations at Georgian Hotel. Save on room prices at Georgian Hotel, Dublin.